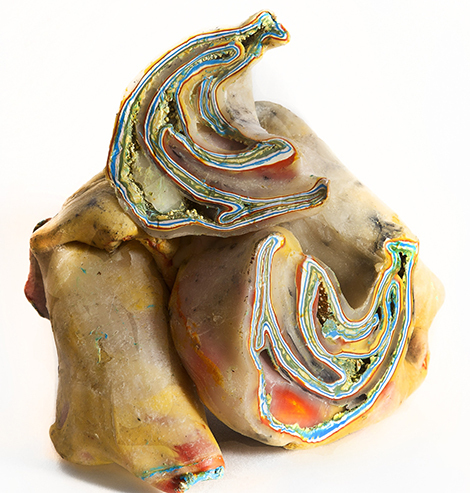 Ellyn Weiss is a visual artist in two- and three-dimensional works, as well as an independent curator, with studios in Mt. Rainier, MD and Truro, MA. She has had more than 24 solo shows and has participated in numerous juried and group exhibitions. 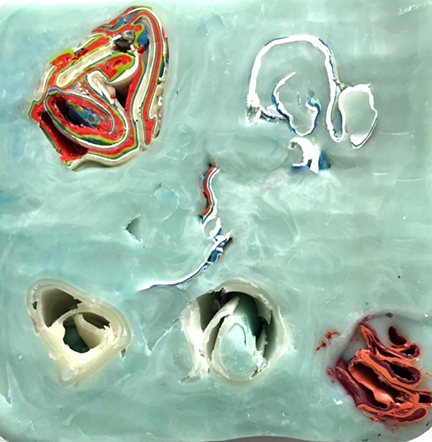 Ellyn works in a wide variety of media; the paintings and sculptures in her most recent solo shows have used wax, oilbar, dry pigment, monoprinting and tar. She also co-curates an ongoing series of exhibitions titled “Zeitgeist”, dealing with important social and political issues of our moment in time. Weiss’s work has for many years been inspired by the imagery of biological and natural structures, which are perfect in both form and function. Most recently, her work has been influenced by the threats posed by global climate change. She is one of three artists who collaborated on an exhibition at the American Association for the Advancement of Science in 2014, entitled “Voyage of Discovery. The artists imagined a journey to the polar region where the ice is receding, disrupting the patterns of life and uncovering forms of life buried for millennia. Weiss serves on the Boards of Directors of the Union of Concerned Scientists, Art Enables, the Touchstone Foundation for the Arts and the Truro Center for the Arts at Castle Hill.